From early childhood, we all know there is a distinct difference in approach between boys and girls in all walks of life. That is why, here at Norfolk Snowsports Club, our ‘Ladies’ have their very own dedicated weekly session. Ladies Club is a group taught session, solely for females aged 16+ whoa re signed off to ski on the main slope. It has a very popular spot on a Tuesday evening from 6.30pm – 8.00pm. With six different groups aimed to match your confidence and ability, we know that we can cater for all abilities no matter how confident or not you may feel. The groups are small enough for the individual to be noticed but also to allow the enjoyment of working within a team. The instructors work over a 6 month programme which offers fun technical sessions with bite-size achievements to increase overall confidence and ability. As with many of our ski sessions, we give you the opportunity to try all the various disciplines, whether it be waves, moguls, freestyle or even ski cross. And Ladies Club is about more than just skiing – the social side is very vibrant with many of the ladies enjoying a little ‘apres ski’ in the bar afterwards and being in a group all working towards the same goals and encouraging each other is a great way to make new friends. 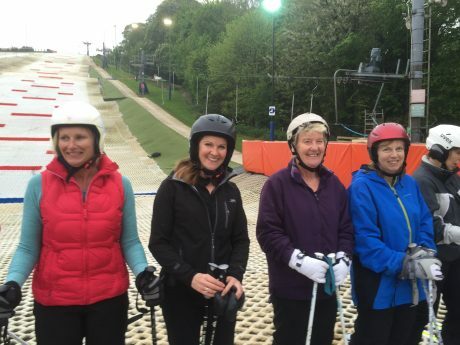 It is brilliant to see the same faces each week and watch how they progress on the slope, but there is no obligation to attend on a weekly basis and some of our ladies just come along as and when they can fit us into their busy schedules! What probably attracts most to Ladies Club is that they have a clear path of attainable progression within a fun and relaxed environment. It’s all about improving your skills, whether it’s so you can show off on that next trip away to the snow or just to challenge yourself within a comfortable environment, free of the pressures of partners or children.